How do I change to a theme not listed in the Appearance screen? I've downloaded some nice themes, icon packages, and pointers from sites like gnome-look. Now, what do I do to use this theme? Do I have to save it in /usr/share/themes? It's not a problem of where they are located. It is a matter of how 11.10 and GNOME 3 have changed. For some reason (I don't know why) the GNOME developers have removed appearance properties from the system settings, under the impression that users should not have the power to choose their own theme. The Ubuntu developers where kind enough to patch the control centre to allow for us to use Ambiance and Radiance, but if you want to use other GTK+ 3 themes you will need to install gnome-tweak-tool . After installing, you can find it by opening "Advanced Settings" from the Dash. 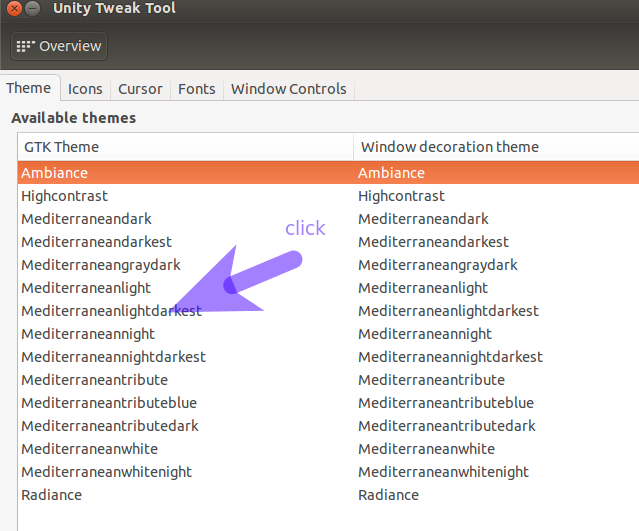 Themes can now be changed through the excellent Unity customisation tool called MyUnity. The key advantage over using Gnome-Tweak is that it does not install all the gnome-shell dependencies. 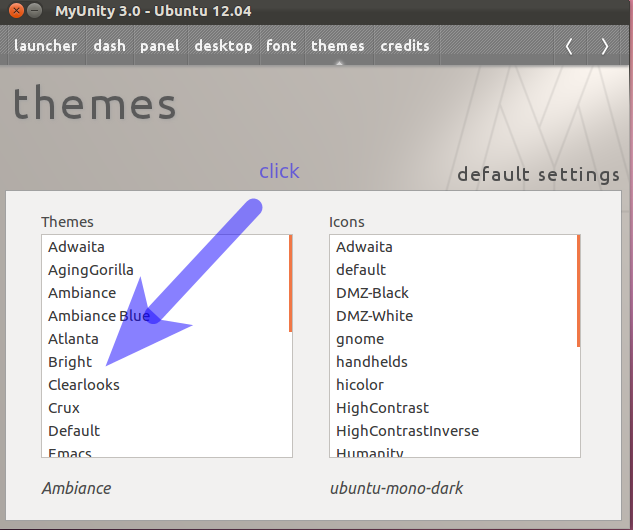 Changing to any installed theme is as simple as clicking on the theme as shown in the list. You can similarly change the icon set via the right-hand list on the same screen. Not the answer you're looking for? Browse other questions tagged unity themes icons or ask your own question. How to change or add themes for Unity? 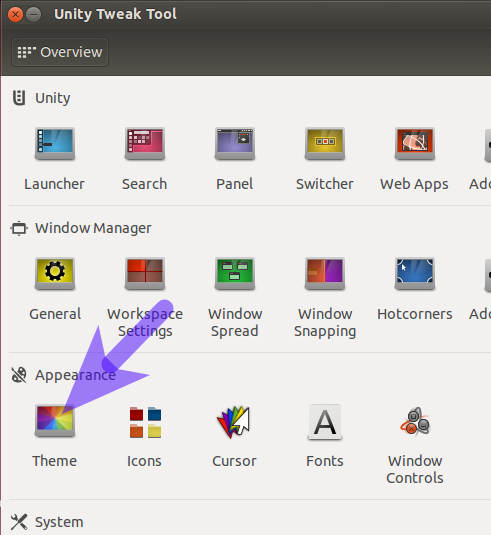 Why does Ubuntu Unity only have 4 themes? Where are theme customizations in 11.10? How do I change icon themes? 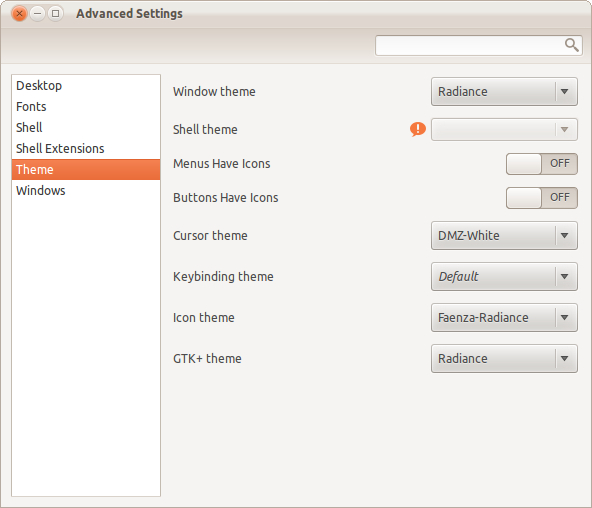 How to add a theme entry in Ubuntu settings? Why is it not possible anymore to customize themes? How do I get and install more themes, icons, and pointers? How to theme the Cinnamon Desktop? How to get a theme tab in the Appearance application?